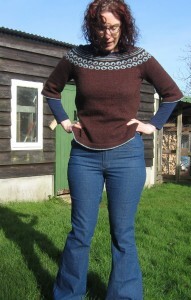 I made another pair of Ginger Jeans back in early February, this time I decided to try out the Flared Jeans that Heather released at the end of last year. I have perfected the fit of the High Waisted version of the jeans and I am really happy with them now. My black skinnies were basically a size 12 with narrow seams straight out of the packet. With these ones I decided to take a pinch out of the length at the waist and make the 12 again. 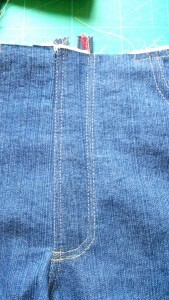 The denim I used was this 12 oz blue denim from our shop. 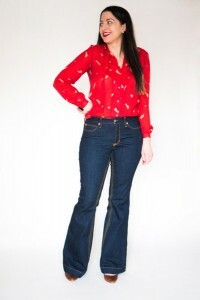 The denim I used in the flares – while being heavier in weight than the black denim skinnies seems to have more stretch – both have 3 % lycra but just goes to show – you should treat each denim differently. It’s got a lot more give in it than any of the other denims I’ve used in my Ginger Jeans, and feels nice and soft to wear. Once I printed out and assembled the pdf , I cut the fabric out on a single layer. This means you keep the grainline straight for each leg piece. I think in making previous jeans – cutting out the legs on the fold I may have skewed the grainline slightly – learn from your mistakes! 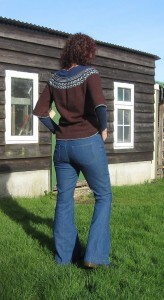 The jeans sewed up quickly – maybe 10 hours over a few days including cutting etc. I had the machines lines up, one for sewing the seams, overlocker for finishing the edges and a machine for topstitching. I followed the tutorial on Heather’s site and it just makes so much sense especially when it came to inserting the fly. The key is to sit down and have time to complete one step in the process as outlined in the tutorial and then go off and reward yourself with a nice cup of tea / coffee or whatever. Once I got to the point of trying on ( I always baste the side seams and try on to check the fit – see above note on the precarious nature of denim – before attaching the waistband) I knew I was going to love wearing these jeans. The size was good so I went ahead and finished them. And that was it – New Jeans – DONE! If you want to make your own – we have the paper pattern in the shop and you can get the flared option pdf on Heather’s site – Closet Case Patterns.